Among those most denounced were the “Barbary Pirates”, a catch-all term used by the Christian kingdoms of Europe to refer to the Muslim pirates who ravaged Mediterranean shipping for over three hundred years. But to the first of those pirates, they were merely taking their revenge for what had been done to them by those kingdoms. None expressed this attitude like the pirate queen of Morocco, Sayyida al-Hurra. The capture of Granada, which led Sayyida’s parents to flee to Africa. She wasn’t called Sayyida al-Hurra when she was born, because that’s not a name at all. Sayyida is the female form of Sayyid, which means “lord”. Similarly al-Hurra (meaning “the honored”) was the title traditionally given at the time to a woman who held a position of independent power but who was not a ruler. This combination of titles is what she is referred to throughout the histories, with her actual name being left out. (It might have been Aisha; but we can’t be sure.) Partly this is because Christian writers did not realise this was just a name, but it does also seem to be a deliberate choice. Who she had been born as didn’t matter. It was who she made herself that was important. She was born in 1485 in Andalusia in southern Spain. Her father was Moulay Ali ibn Rashid al-Alami, a Muslim noble who could claim direct descent from the Prophet Muhammad himself. His wife (and Sayyida’s putative mother) was a Christian-born Spaniard who had converted to Islam named Zohra, whose maiden name was Fernandez. When Sayyida was seven years old, her family were forced to flee Andalusia as the grand “reconquista” of Isabella and Ferdinand swept in to drive the Muslims from the Spanish peninsula. For the rest of her life, Sayyida would bear a grudge against the people who had driven her family from her childhood home. The family settled in Chefchaouen, a site a few miles inland from the Moroccan coast which Sayyida’s father had founded originally as a military base in 1471. Many refugees fleeing from Spain settled there, transforming it into a city that would become known as “the blue pearl” for the distinctive shade they painted the walls. This was where she spent the remainder of her childhood, receiving the education that the daughter of a nobleman merited. She learned languages, theology, mathematics, and other disciplines. Among her tutors was Abdallah al-Ghazwani, a famed religious scholar and architect who is nowadays honored in Sufism as one of the “seven saints of Marrakesh”. Some time after the turn of the century Sayyida married Abu Hassan al-Mandari, a nobleman thirty years her senior. Some sources say she married him in 1501 (at the age of 16), others that she married him nine years later in 1510. (She might not even have married Abu Hassan himself but rather his son, though this is unlikely.) He was the head of another of the noble families that had fled Spain, and this was a diplomatic marriage which had been arranged many years earlier. However it does seem to have evolved beyond that into genuine affection and partnership, as the pair worked to improve the city of Tétouan. 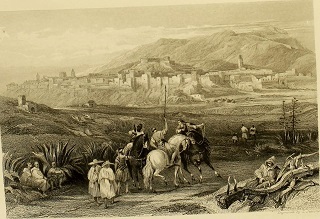 Tétouan as depicted in a 19th century travel guide. Like Chefchaouen, Tétouan was a fortress that had been transformed into a true city by refugees from the Reconquista. It had been destroyed by the Christian kingdom of Castile around 1400 because it had become a base for Muslim privateers to attack their shipping. In 1484 the Wattasid sultan Muhammad ibn Yahya had granted the site to Abu Hassan after he had fled Spain. He had raised fortifications around it to prevent Spanish attack, and within the walls houses had sprouted up. A Grand Mosque was built, and Tétouan was transformed from a fortress into a bustling city, humming with trade. The “Old City” of Tétouan is nowadays a UNESCO World Heritage Site, preserving the buildings that Sayyida and Abu Hassan had built. Sayyida learned a lot from her husband, who treated her as an equal and as more of a co-governor than as a subordinate. When he died in 1515, she was the one who assumed the reins of power in her own right. This was when she took the title of “Sayyida al-Hurra, Hakimit Titwan”; literally “the honourable great lady, governor of Tétouan”. It was unusual for a woman to rule in Islamic society at that time, but far from unknown. Competency was the key to leadership, and as long as she was able to do the job that was enough for them. (Though it probably helped that her brother was a vizier to the sultan of Fez, Ahmed al-Wattasi.) And as she would show, she was more than up to the task. Sayyida had never forgotten how her family had been driven from their home by Isabella and Ferdinand, and she was determined to pay their kingdom back for that affront. And if she could make some money and enrich her city at the same time, that would be all to the good. Tétouan had been a base for piracy before, why not make it one again? With this plan in mind, Sayyida sent envoys west in order to arrange a meeting with the king of the Mediterranean pirates, Oruç Reis. 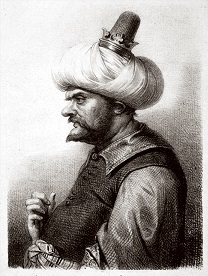 A 19th century drawing of Oruç Reis by Achille Devéria. Oruç Reis was a sailor from the island of Lesbos, the son of a Turk and a Greek. He was initially a legitimate merchant, but his brother was killed and he was captured in a sea-raid by the Knights Hospitaller. When he was rescued by another of his brothers he turned privateer to seek revenge. The Reis brothers became state-sponsored corsairs, getting funding and patronage for their fleets from Muslim rulers in exchange for confining their ravages to enemies of the state; and for kicking back a third of their spoils of course. Oruç Reis made his base on the island of Djerba (off the coast of modern-day Tunisia) where he made a specialty of raiding boats belonging to the Papal States. Sayyida and her people would already have had reason to be well-disposed to Oruç Reis, as he had put his fleet to work ferrying refugees from Spain to Africa between 1504 and 1510 as the persecution of religious minorities on the Iberian peninsula intensified. This act of charity earned him the affectionate nickname of “Baba Oruç” – “Father Oruç”. It’s thought that it might be a misinterpretation of this which led to the name he was known by in the west: “Barbarossa”. (Which is the Italian for “Red Beard”; whether Oruç Reis actually had a red beard isn’t certain.) His other nickname of “Gümü? Kol” was earned in 1512; it means “Silver Arm” and that is what he had as a replacement after he lost the original in a battle to drive out Spanish colonists from Africa. 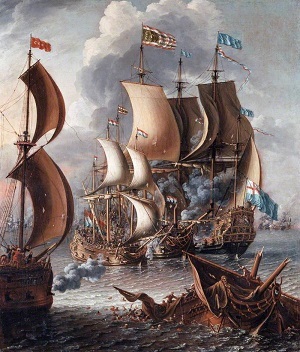 “A Sea Fight with Barbary Corsairs” by Laureys a Castro. The ambitious Oruç Reis wanted a kingdom of his own, and so he and his brothers set out to drive the Spaniards from Algiers and reclaim it. Once they did so Oruç Reis deposed the previous ruler and declared himself Sultan, but he was soon forced to recognise reality and offer to join the Ottoman Empire in order to secure their protection. With their aid the Reis brothers were able to hold Algiers, but Oruç was killed during the fighting. His brother Hizir took up his leadership position and was also known to Westerners as Barbarossa. To his fellows he was known as Hayreddin, which means “goodness”, a title bestowed on him by an Ottoman sultan. The Reis brothers had hitched themselves to a rising star in their choice to ally with the Ottomans as that sultan was Suleiman the Magnificent, who would transform the Ottomans into a Great Power of Europe. Hayreddin served Suleiman loyally both as Pasha of Algiers and as the admiral of his Mediterranean fleet. A contemporary portrait of Hayreddin by an unknown artist. Sayyida continued her alliance with Hayreddin, and her fleet kept on working the western Mediterranean. When the Ottomans and the French became allies it further isolated the Iberian countries, which suited Sayyida just fine. She continued to ravage their fleets over the following decades, which all eventually culminated in the peak of her career as a pirate: the raid on Gibraltar in 1540. At the time the Rock was a possession of Charles V, the Holy Roman Emperor. He was a long-time rival of the Ottomans and had even tried to lure Hayreddin away from them with an offer to make him “lord of North Africa”. The messenger had been told to arrange Hayreddin’s assassination if the offer was rejected; he never had the chance as the insulted Pasha killed him in response to the offer. The chance to bloody the Emperor’s nose was one that Hayreddin was willing to support; and a joint expedition was planned. Gibraltar was a soft target, all the softer for not realising it was one. Fortifications had been allowed to crumble, despite the enormous strategic importance of the island to the Empire. It was where their fleet found harbour for maintenance and repair; with most of the work being carried out by enslaved Turkish prisoners. These prisoners were not well guarded, and several of them managed to escape. In 1540 there was a mass breakout led by man recorded as being called Caramani. This is an Italian surname, so either he was a convert or it’s a transliteration of a Turkish name. The escapees found refuge in Algiers, where they met with Hayreddin’s lieutenant Hasim Aga. Caramani and his men had vital information for planning the raid, including the issues with the fortifications, unguarded approaches and where the troops were stationed throughout the island. 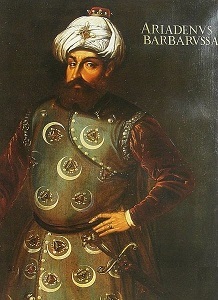 As a result Caramani was put in charge of the raid on the island, with the fleet led by an experienced Ottoman admiral. The fleet (which included a number of Sayyida’s ships) was spotted as it made its way to the island in September of 1540, and Gibraltar immediately started scrambling to prepare for a possible attack. As the attackers knew, this wasn’t something they could really do in the time available to them. The fleet landed on the east side of the island on the 9th of September, and sent one of their number who could pass as a Spaniard out to spy on the island. He went to a nearby town and bought some bread and fish, satisfying himself as he did so that the fleet had not been spotted. So they sailed south towards the main harbour. On the way they were challenged by some guards, but they lied and said they were Spanish galleys, part of a fleet coming to the island. As a result they were able to make a landing and begin an assault on the town. How successful the raid was is a matter of debate. According to the western sources (which are the most detailed) it was a great victory in driving off the invaders, with each setback they suffered hailed as a sign of divine favour. On the other hand they can’t avoid admitting that the Turks managed to free a large number of slaves, and conversely also managed to capture a large number of locals and make them slaves of the Ottomans. They didn’t manage to capture and hold the island, but it’s doubtful they ever intended to. Reading between the lines of the local accounts it looks like a classic raid, with the invaders withdrawing to their ships in good order once they’d spent as much effort as they intended on securing booty. In the end the Turks suffered less than twenty casualties and captured at least seventy locals, plus fifteen crewmen from two unfortunate merchant vessels that arrived into the harbour during the raid and were immediately captured. While a negotiation under truce was being made to ransom the prisoners the Turkish camp was attacked by two brothers named Anton and Francisco Calvo, a violation of diplomatic norms that nonetheless became one of the small victories that the western chroniclers seized on after they managed to rescue some of the prisoners. 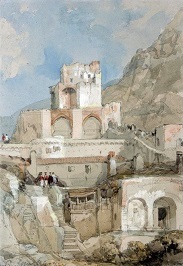 The rest were loaded onto the boats and taken off to the fortress of Velez de la Gomera, where those who were worth more as ransom than slaves were sold off to the local lord. He then ransomed them back to Gibraltar for the 5000 ducats he had paid for them; plus a 10% commission of course. Some of the Spanish historians claim that the Turkish fleet was then attacked by the Spanish armada on their way back to Algiers and fourteen of the sixteen ships were sunk, however it seems like this may be a conflation with a later raid on the island of Alboran that ended poorly. By this time Sayyida’s control over the “Barbary pirates” in the western Mediterranean made her a power to be reckoned with in the Muslim kingdoms of northern Africa. In fact she was powerful enough that when the Watassid Sultan of Morocco proposed a marriage alliance to her, she was able to dictate her own terms for the arrangement. Sultan Ahmad el Outassi was persuaded to hold the wedding ceremony in Tétouan; an unprecedented display of deference from the ruler of a kingdom to the ruler of a city-state. The marriage appears to have been solely a diplomatic one, as the two continued to live in their separate capitals after that. This did make Sayyida literally a pirate queen. Sayyida al-Hurra reigned as governor of Tétouan for over thirty years, but in 1542 that rule finally came to an end. Open war with Portugal destabilized trade in the city and setting the stage for her overthrow. Taking advantage of this Ahmed al-Hassan al-Mandari, a kinsman of Sayyida’s first husband and the husband of her daughter, reached out to the enemies of her new husband. The Wattasids were on the wane, and the Saadis were on the rise. They were a noble family from the southern part of Morocco who grew powerful enough that the Sultan tried to attack and humble them, a move which backfired when they held him off and forced him to recognise their independence. The war with Portugal offered them a chance to position themselves as the saviours of the kingdom and set them on the path that would see them take over the kingdom within fifteen years. 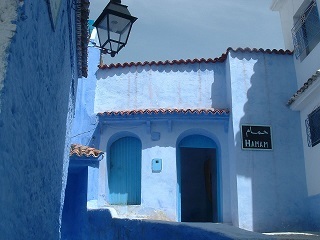 With their support Ahmed forced Sayyida to abdicate, and she retired to her childhood home of Chefchaouen. She lived there for around another twenty years, and died in 1561. Sayyida may have fallen from power, but the echoes of her rule continued to be felt for some time. The people of Tétouan kept up their piratical pursuits, until a retaliatory raid by the Portuguese destroyed their harbour in 1565. Mediterranean piracy would remain a serious problem right up until the 19th century. In fact it was pirates operating out of northern Africa that led to the initial formation of the US Navy in order to protect their merchant vessels. As for Sayyida’s personal impact; she was the last recorded woman to bear the title of “al Hurra”. The egalitarian attitudes that had prevailed during the times of Muslim Iberia that had given freedom to people like Wallada Bint al-Mustakfi that they could not have enjoyed in any other kingdom were now fading away. But the memory of Sayyida al-Hurra, the pirate queen of Morocco, remained. Sayyida was born in the Kingdom of Granada, the last Muslim ruled state in Spain. Her family moved to Morocco after the fall of the empire in the year 1492. She, along with her first husband rebuild the city of Tetouan in Northern Morocco, which she later ruled alone after the death of her husband in 1515. Her actual name is unknown and the name Sayyida al Hurra (meaning noble lady who is free and independent; the woman sovereign who bows to no superior authority) has been prescribed to her because of her strong and bold nature. She became the last person in Islamic history to hold the title of al Hurra (meaning the queen). She is also known as Hakima Tatwan, meaning Governor of Tetouan. Sayyida was an unconventional queen with the title of ‘pirate queen’ often being ascribed to her. She controlled a large part of the Western Mediterranean sea with her pirate fleet that she used to dominate over the Spanish and Portuguese ships. When she later married the king of Morocco, she had no intention of giving up her power, and instead of going to the capital city she made the King come over to Tetouan. This is the first and only time in the history of Morocco that the king did not get married in the capital. After 30 years of rule, she was deposed by her son-in-law, and her later fate remains unknown. She vanished from history altogether. The lives of these women have often been ignored while studying and talking about Islamic history. Their challenges, accomplishments, etc deserved to be known but never were. Given the social context in which these women lived, everything that they could achieve required them to put up a fight, to be fearless in the face of constraints, and unapologetic of their own identities. While it is true that a lot of things in the lives of these women were still governed by patriarchal and societal traditions, the many things they could manage to fight and change were a precursor to a larger struggle that was yet to come, and continues to take shape even today. This article (and the list of women mentioned) is in no way exhaustive of the women we must know of and duly appreciate, but a mere subset of the many people in history gone unnoticed. It is an attempt to retrace history for a more inclusive and real representation. Sayyida al Hurra, (Arabic: السيدة الحرة‎), real name Lalla Aicha bint Ali ibn Rashid al-Alami, Hakimat Titwan, (1485 – July 14, 1561), was a queen of Tétouan in 1515-1542 and a pirate queen in the early 16th century. She is considered to be “one of the most important female figures of the Islamic West in the modern age”. The life of Sayyida al Hurra can be understood within geopolitical and religious contexts. The Ottomans had just captured Constantinople in 1453 marking the end of the Roman Empire. She was two years old when the Portuguese started their colonial conquest by capturing some ports at the western coast of Morocco starting the year 1487. 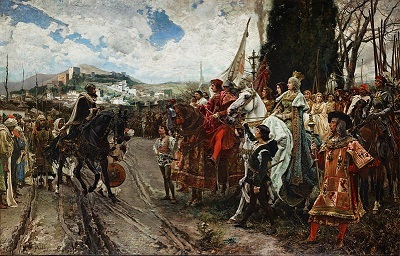 A few years later, Granada was falling into the hands of the Catholic Monarchs (los Reyes Católicos) Isabella I of Castile and Ferdinand II of Aragon and with that, forced conversions of Muslims in Spain followed. Allied with the Turkish corsair Barbarossa of Algiers, al Hurra controlled the western Mediterranean Sea while Barbarossa controlled the eastern. She was also prefect of Tétouan. In 1515 she became the last person in Islamic history to legitimately hold the title of al Hurra (Queen) following the death of her husband, who ruled Tétouan. She later married the Berber King of Morocco, Ahmed al-Wattasi, but refused to leave Tétouan to do so. This marriage marks the only time in Moroccan history a King married away from the capital, Fez. The title sayyida al Hurra means “noble lady who is free and independent; the woman sovereign who bows to no superior authority.”  Hakimat Tatwan means governor of Tétouan. Sayyida al Hurra was born around 1485 (Hijri around 890) to a prominent Muslim family of Andalusian nobles who fled to Morocco after the fall of Grenada in 1492. 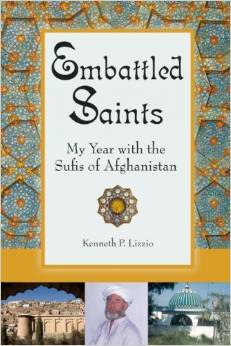 She is a descendant of Sharif Abd as-Salam al-Alami, who is a descendant of Hasan ibn Ali. She fled with her family to Morocco when Ferdinand and Isabella conquered the Muslim kingdom of Granada in 1492, at the end of the Reconquista and settled in Chefchaouen. Sayyida’s childhood was happy and secure, yet clouded by constant reminders of the forced exile from Granada. She was married at 16 to a man 30 years her senior, a friend of her father and refounder and governor of the city of Tétouan, himself an Andalusian Moorish refugee, Ali al-Mandri, to whom she was promised when she was still a child. Some sources state she was married to al-Mandri’s son, al-Mandri II. An intelligent woman, she learned much assisting her husband in his business affairs. She was a de facto vice-governor with her husband entrusting her the reins of power each trip he made outside the city. 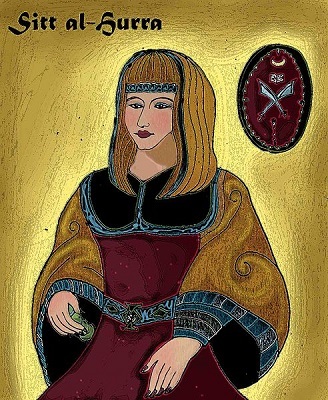 When the latter died in 1515, the population, who had become accustomed to seeing her exercise power, accepted her as a governor of Tétouan, giving her the title of al-Hurra. Spanish and Portuguese sources describe al-Hurra as “their partner in the diplomatic game”. Some historians believe that the unusual “degree of acceptance of al Hurra as a ruler” could be attributed to “Andalusian familiarity with female inheriting power from monarch families in Spain such as Isabella I of Castile. Others believe that al Hurra succeeded as governor because she was “the undisputed leader of pirates of the western Mediterranean”. In 1541, she accepted a marriage proposal from Ahmed al-Wattasi, a Sultan of the Moroccan Wattasid dynasty, who traveled from Fez to Tétouan to marry her. Her marriage with him was the only recorded instance a Moroccan king married outside of his capital. This was because she was not ready to give up her role as queen of Tétouan or even to leave the city for the marriage ceremony, forcing al-Wattasi to come to her. It is believed that Sayyida insisted on this to show everybody that she was not going to give up governing Tétouan even though married to the Sultan. Sayyida al Hurra lived a life of adventure and romance. She concurrently appointed her brother Moulay Ibrahim as vizier to Ahmed al-Wattasi, Sultan of Fez, and this made the Rashids positioned themselves as major players in the effort to unify Morocco against the fast-growing powers of Spain and Portugal. Sayyida could neither forget nor forgive the humiliation of being forced to flee Granada. In her wish to avenge herself on the “Christian enemy”, she turned to piracy. She made contact with the Ottoman pirate Barbarossa of Algiers. Piracy provided a quick income, “booty and ransom for captives”, and also helped to keep alive the dream of returning to Andalusia. She was well respected by Christians as a queen who had power over the Mediterranean Sea. She also was the one with whom one had to negotiate the release of Portuguese and Spanish captives. 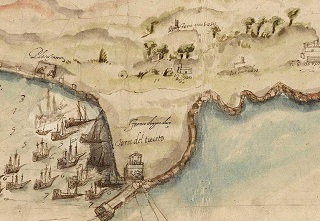 For example, in The Forgotten Queens of Islam Fatima Mernissi mentions Spanish historical documents of 1540 according to which there were negotiations “between the Spaniards and Sayyida al-Hurra” after a successful pirating operation in Gibraltar in which the pirates took “much booty and many prisoners”. 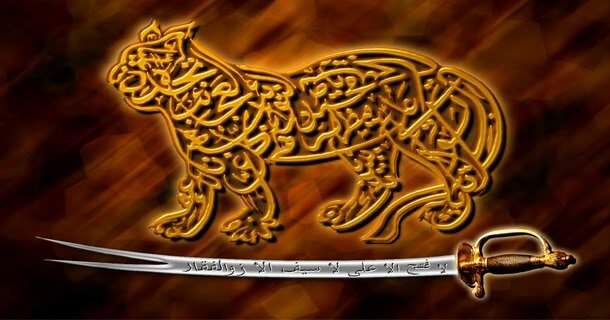 After she had ruled as governor for 30 years, her son-in-law Muhammad al-Hassan al-Mandri overthrew her in October 1542. According to the Yemen Times, “She was stripped of her property and power.” Accepting her fate, she retired to Chefchaouen, where she lived nearly 20 years more, until July 14, 1561.